I am feeling inspired by turquoise right now. I often find myself attracted to a particular color or stone. The Soft Flex Company description of turquoise is as follows…. Turquoise is the December/Sagittarius birthstone. Both turquoise and turkey (that great holiday bird) are derived from the country that first introduced both to Europe, Turkey! However, Turquoise is found all over the world. It has been important to Native American heritage. 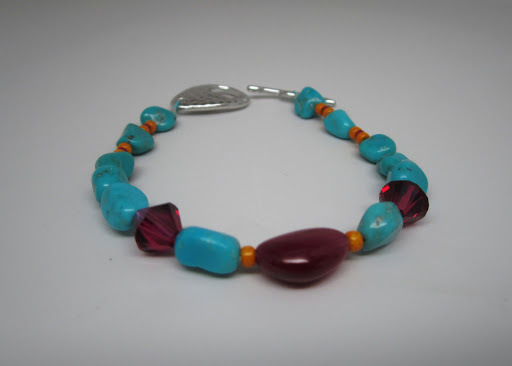 Their intricate, hand made jewelry has extraordinary craftsmanship that often incorporates Turquoise. It can be found in varying colors of blue and green. Turquoise (blue/ green) represents the throat and heart chakras. 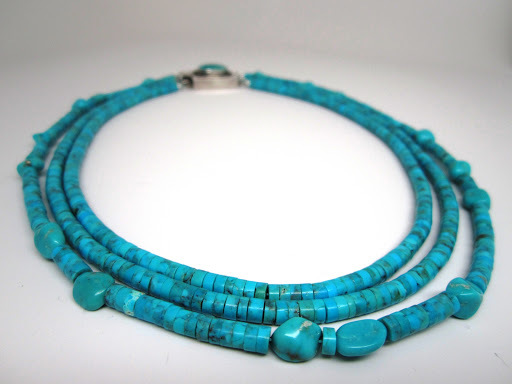 Turquoise is a master healing stone. It heals and cleanses all chakras – enhancing creative expression, emotional balance and friendship. It is considered a sacred stone by many cultures. Turquoise is the birthstone for December/ Sagittarius. This color is beautiful when mixed with red. In the above design, the middle stone is a ruby. The picture doesn’t quite capture the iridescent quality of this amazing stone. I handpicked this individual ruby and have been waiting for just the right design to showcase its loveliness. Oh my, I love these earrings. They are exceptional! 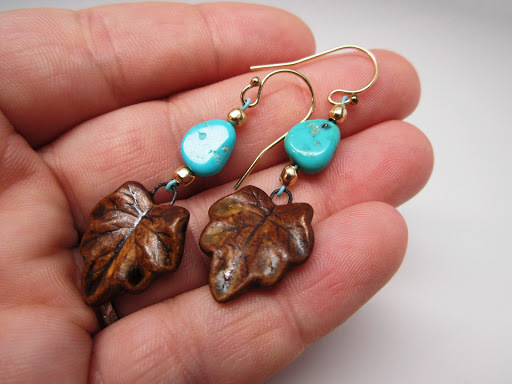 They are light weight and the little leaves from Earthenwood are a perfect match for the earthy feeling turquoise beads. Don’t worry, I won’t only be making jewelry with turquoise. This just happens to be where my heart is right now. I love all of the colors of the rainbow! But, more than anything, I love to use really nice and very special materials. As my shop grows, you’ll definitely see that each item is made with love. Show Your Colors in person!